Coho smolts that had their start in life at the Hoy Creek Hatchery in Coquitlam are well on their way to adapting to life in the stream. Approximately 5000 smolts were released at Hoy-Scott Watershed Society's Salmon Leave Home event on May 7th. When ready, they will make their way from Hoy Creek to Scott Creek, then Coquitlam River, then to the Fraser River, and then on to the Straight of Georgia and the Pacific Ocean. The weather was perfect for the family fun free community event, and there was a steady flow of people throughout the day. 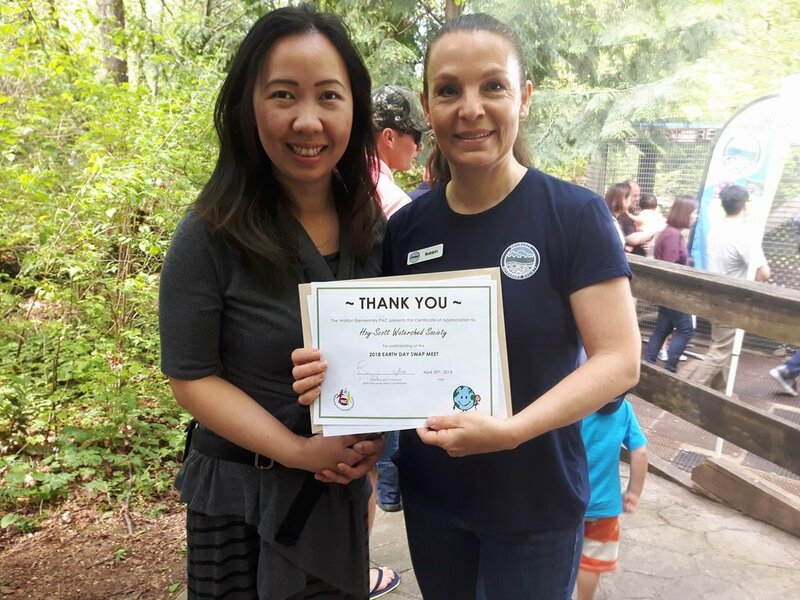 Patrons learned about the life-cycle of the salmon, viewed hatchery facilities, and had fun building bird boxes, getting face-painted, and doing fish-crafts. Music was provided by 98.7 The Point radio. Watershed Watch Salmon Society was also on had with crafts for the kids and education for all. Jay Peachy honoured the Kwikwetlem First Nation traditional territory and delivered the "Salmon Song" accompanied by drumming. The highlight of the day was the release of the smolts, as children of all ages delighted in carrying young salmon in buckets from the rearing pond a short distance to release them into Hoy Creek. The society wishes to thank all of our hard working volunteers from Pinetree Secondary. Over the summer things generally slow down at the hatchery, but volunteers still continue to oversee the care of some 25,000 coho fry, approximately 5 months old, who will be transferred into the rearing pond before June. The bird box building station at Salmon Leave Home. See ALL of our photos from Salmon Leave Home on our Facebook album HERE. Work also continues in the riparian areas of the watershed to ensure invasive species are reduced and native plants are thriving. A healthy riparian area ensures a healthy creek.